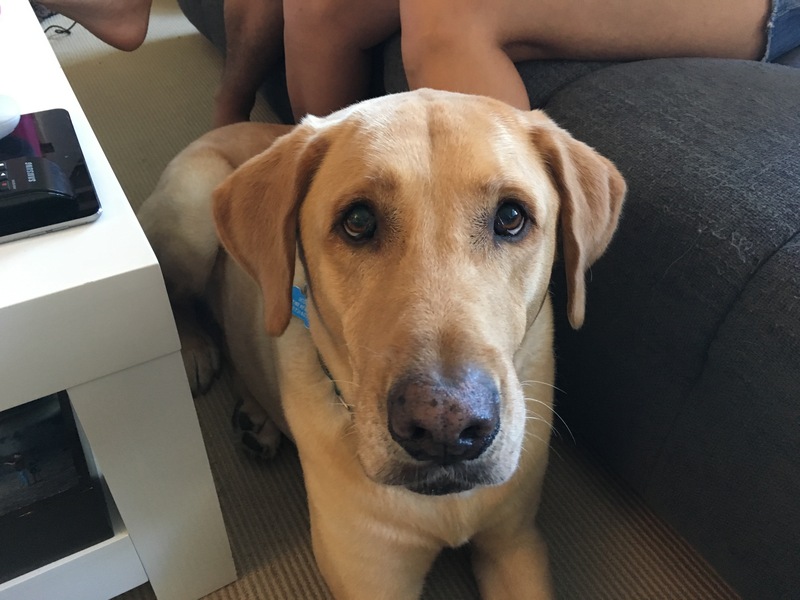 Scout is a five-year-old Yellow Lab who lives in Santa Monica. His guardians set up a dog behavior training session with me due to his nervous behavior around new situations and people outside of his family. They wanted me to help him learn to stop jumping up or barking non-stop at guests, even those he knows). I got a first-hand example of scouts barking when I arrived for the session. I could instantly tell that Scout was disagreeing with me from a very insecure place. He was stiff, hunched over and backed away after each series of barks. I offered a few treats to try to help scout relax a bit. This work but only temporarily. I had to get down and adopt some soft body language while moving slowly to help scout relax enough to stop barking. In the course of discussing the situation with Scott’s family, I learned that he was sent to a training facility at a very young age. Because these trainers used Dominance theory, they shattered scouts confidence by overly correcting him during his critical socialization period. If you have a puppy and what to get a trained, I strongly advise you avoid any place that takes your dog away from you. Training a puppy using positive reinforcement is easy and results in a confident dog that wants to listen to you. To help Scout stop barking at guest to the home, I needed to help him adopt a new behavior. I suggested that the guardians incorporate some rules and limits. Humans often think that removing boundaries and limits helps insecure dogs feel more comfortable. In fact it usually does the opposite. If the dog feels like there are no rules, it feels like it is in a leadership position. If it’s in a leadership is position that it is somewhat responsible for us. Anytime you’re responsible for something there are some pressure involved. By introducing boundaries and limits and enforcing them within two or three seconds consistently, scouts guardians will help him start to think of them as the leader and parties responsible for the things that are currently stressing him out now. I also suggested that they start practicing my putting with a purpose methodology. It’s going to take all of the members of the family a couple of days to get into a habit of only putting scout when he does something for them. But once they do make this transition, they will be practicing many dog obedience training sessions without even thinking about it each time they put their dog. Another way to stop dogs from reacting like Scout was is to teach them to focus on something. I pulled out some high-value treats and sat down to introduce a focus exercise to scout. This exercise will give the humans the ability to redirect Scout whenever necessary. They may need to utilize a leash if the dog is unable to settle itself down. Once scout can focus without the need of a leash, the guardians will be able to take the next step; practicing the focus exercise amongst distractions of gradually increasing intensity. Once Scout has mastered the focus exercise, his guardian should be able to redirect his attention and help him settle down before he gets the chance to truly get worked up. But in the meantime I knew I needed to give the guardians tools that they could use to stop scout from getting into this runaway barking mode. The family’s father was working on the weekend and arrived a little bit late for our session. We had him text us when he was about to knock on the door so that I could use this as an opportunity to show the guardians how they could use a leash to stop Scout from getting all worked up when someone arrives at the door. Scott settled down faster than usual, but of course this was with a member of the family. The real barking happens when it’s other people. The family son arranged to have one of his friends come by so that we could practice the exercise again. But this time I handed the leash to the guardians themselves. It will be important that the guardians take their time and correct Scout instantly, anytime that he starts to rush forward ahead of them. Also be important that they do not hiss too many times or use the leash to pull scout away. This will activate his opposition reflex and ensure a tugging contest. The person holding the leash will need to pay particularly close attention to scout. If they are able to correct him before he starts to bark or move forward, they will find is much easier to do so. As we were wrapping up the exercise the guardians informed me that they were having a party the following day. This will give them an outstanding opportunity to put this new door meeting ritual into a practical application. By the end of the session, scout seemed much calmer. He was carrying himself with more confidence rather than being all hunched over and stiff. I consistently and forcing the new rules while simultaneously practicing the new door answering ritual, Scott will feel less responsibility and therefore less pressure. As he learns to relax and see his humans as being it be authority figures, he will be able to stop getting all worked up when people arrive and instead follow the lead of his humans.